This is a major addition to the Stenhammar discography, a splendid performance of perhaps his finest work, captured in superb sound, whether heard in SACD or stereo. Stenhammar occupies an interesting place in the rich history of Swedish music. He was a pianist by training; his piano concertos are worthy of much more frequent performance outside Scandinavia. His work is deeply melodic, its successes fine and hard-won. Any study of Stenhammar’s life reveals an intensely self-critical character. The G minor symphony took four years to compose, and was finished in 1915.This ‘second’ Symphony was presented as ‘Symphony in G Minor’; he had suppressed its predecessor. Yet the First Symphony is more than worthy, if more prolix than the Second. Even so, the Second Symphony (there were no successors), though quite taut in construction, has something discursive about in its narrative. But its geniality is not without moments of darkness. Stenhammar is not a composer with his heart on his sleeve, dramatically expressive. His seriousness of purpose is left to speak for itself. In the first movement, we find both light-hearted moments and sombre sections. The genius lies in the ability to build quite simple themes up into developed ideas. The artistry is superb, but in no sense showy. The second movement is fascinating – a serious processional, not overtly sentimental, but the more moving in its simplicity. Immediately attractive is the scherzo and trio third movement, formal in shape, but quieter and more pensive than most symphonic scherzos. The trio is dominated by woodwinds and horns. To the ear, the movement is delightful and memorable, but the depths are moving. Perhaps the most extraordinary of the four remarkable movements is the finale, often swift and powerful in the vivace outer parts. Formally, it is an energetic double fugue. The central part of the movement, marked passionato, was described by the composer as ‘heart’s song brimming over’. Lindberg here brings out this aspect, and the contrast with the surrounding sections, with both intensity and reflective stillness. This looks forward to the quicker but not bombastic ending. Stenhammar’s transition from the slow to the quicker ending is masterly, but it requires perfect pacing, found here. I have loved this symphony since my first encounter, many years ago. I have long admired Neeme Järvi’s live account with the Gothenburg Symphony Orchestra (now available with the first symphony, both piano concertos and other works on Brilliant Classics 94238) but I think the new recording even finer. Lindberg’s tempi are a fraction slower, but pace and shape are never lost, and the superior sound quality enables the fine detail of Stenhammar’s counterpoint to emerge clearly. Stenhammar had deep affection for the Musik till August Strindbergs “Ett Drömspel”. Originally composed for use in 1916, it has had a chequered career. The present arrangement was made by Hilding Rosenberg in 1970, for concert performance.The music reveals itself as more significant than the simply occasional. 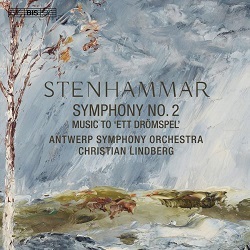 Stenhammar’s genius shines through every bar, with inventive orchestral effects and shifts in mood.